Whelks from around the British Isles. The Common Whelk is easy to recognise: it is a big snail, with a strong whitish or grubby shell. Like a garden snail, it has a head with two stubby tentacles at the front and a flat 'tail' behind; the exposed parts of the body are pale-coloured with striking black mottles and speckles. It moves, like a land snail, by gliding along on the wide flat foot, powered by muscular waves which flow backwards along its sole, hitching each part of the foot fractionally forwards as they pass. On the top of the 'tail' is a round shelly plate: if the whelk is alarmed and withdraws into its shell, this is the last thing to be pulled in, and closes off the entrance. The shell is extremely strong, and with the entrance sealed, the whelk is safe from most predators. Whelks are found all around Britain and on all types of sea bottom, but can be unexpectedly difficult to spot. The black-and white foot is conspicuous once you see it, but the shell is commonly dirty or covered in silt so that it merges into the background. 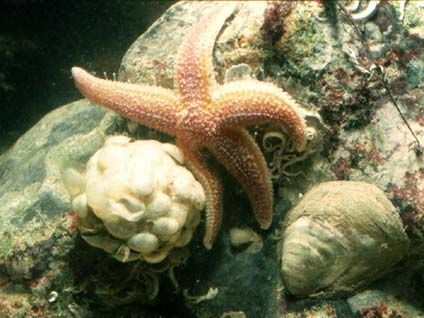 On soft sediments, whelks often plough along with the foot buried, drawing in clean water to breathe through a snorkel-like tube called a siphon which projects forwards and upwards from the front edge of the shell, its tip remaining above the sediment. Whelks will eat most things, detecting prey at a considerable distance by smells carried in the water. They make themselves unpopular with fishermen by eating oysters and scallops, drilling through the shell until they can scrape out the flesh. Other bivalves and worms also figure on the menu, and they happily eat fresh carrion, so fishermen catch whelks by baiting pots like miniature lobster pots with shore crabs or fish. They are also dredged. Boiled for ages and served with a trace of vinegar, they are said to be delicious if you like that sort of thing. Whelk stalls selling cooked whelks used to be very common in the north of England. 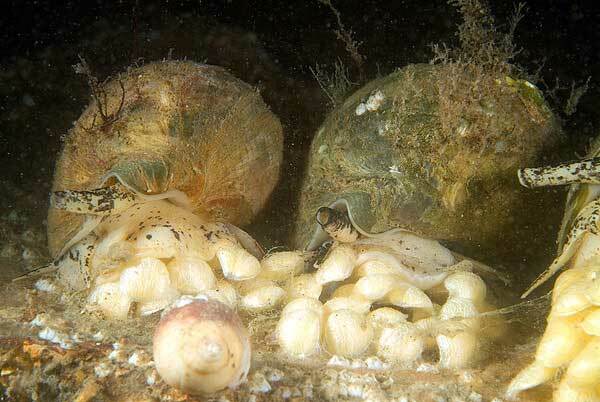 You can see whelks laying their eggs, but only if you dive between about November and January. Yellowish or cream-coloured capsules the size of a fingernail are stuck to stones, or in shallow water to the posts of jetties, one female laying several layers of eggs to form a mass about her own size; this takes her several days. Larger masses, occasionally football sized, result from a number of whelks laying their eggs together. Each capsule contains hundreds of eggs, but only a few are fertilised, and when these hatch, the baby whelks feed on the unfertilised eggs. Eventually they will emerge from the capsule in spring as miniature whelks. 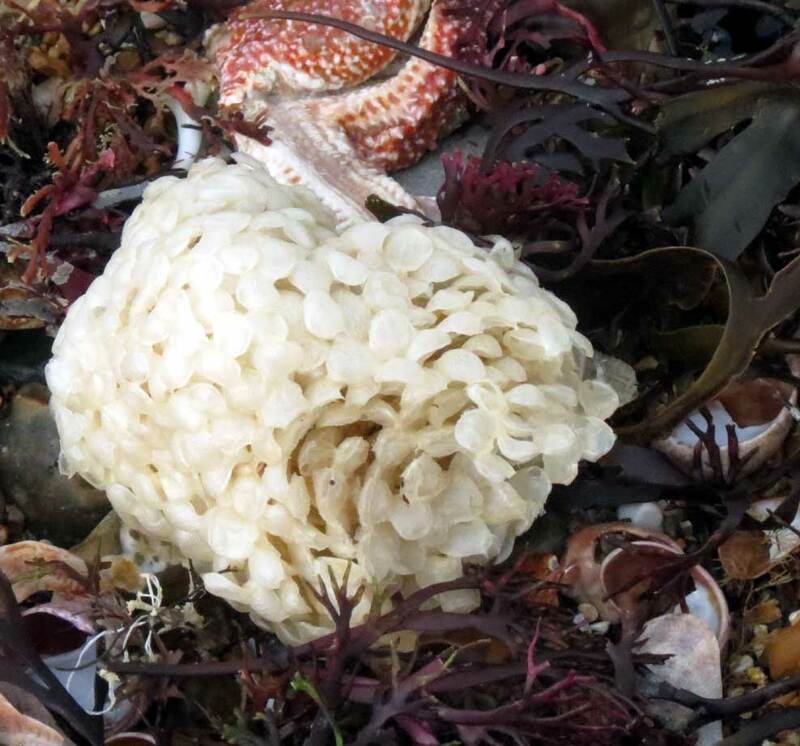 The sponge-like masses of empty capsules are often detached and washed up on the shore in summer. Empty whelk shells are much in demand as homes for large hermit crabs. You will see more whelk shells occupied by hermit crabs than those with the original owner in residence. Whelks are long-lived, but the shells are strong enough to survive use by several generations of hermits, and as there are always more crabs than shells, they will only be discarded when they are too damaged to use. Common Whelks, Buccinum undatum, spawn in winter, and were very active. There seemed to be large numbers everywhere, sometimes twelve or more in an area 30 cm square. In places numerous individuals were apparently converging on one area; elsewhere I saw several isolated whelks in a most unusual position, standing with the shell lifted very high above the foot, perhaps to lift the siphon higher in the water column. 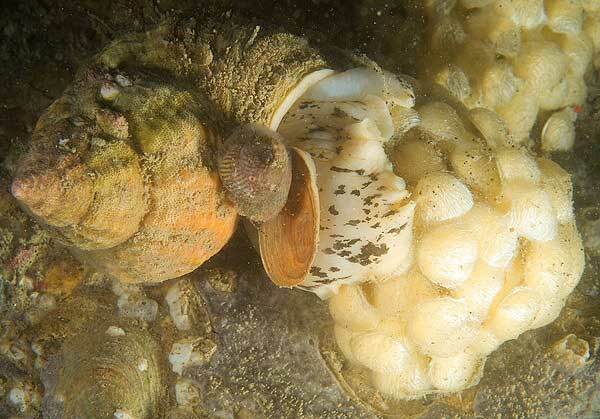 They were probably trying to scent the presence of other whelks, so they could congregate to mate and spawn. Where we saw them spawning, they were always in groups - I saw five laying their egg capsules onto a single egg mass about 12 x 8 x 8 cm. They are hermaphrodite, each individual producing both eggs and sperm, but instead of fertilising their own eggs, they mate, exchanging sperm with another individual so that their eggs are cross fertilised. News item of 17 July 1997.